Editing: Crop & rotate at same time; levels, separate levels on red, green & blue; slight change in yellow hue and saturation; noise removal; resize; unsharp mask; save for web. I read this poem for the first time when I was a little girl in a book of poetry I received for Christmas. This picture reminds me of how I would picture Xanadu in my mind - somewhere strange & mystical looking. Actually, this is along the road to the Great Sand Dunes National Park and Preserve near my home of La Jara, Colorado. It is a very different and unusual place. When the sun is setting it looks very mystical and surreal. When I was at the Sand Dunes taking pictures it was very cloudy and I thought the light would be pretty crappy for pictures. Luckily, a break in the clouds came for only about 6 minutes and I got some nice pictures. Congratulations on the Ribbon, very well deserved with this spectacular image! Congrats on your ribbon..!! Very pretty shot..!! Message edited by author 2005-11-17 23:54:46. Thank you, Everyone, for all your wonderful comments. It makes me feel so happy that so many people like my picture. It was hard for me to take this picture, the last time I went to the dunes specifically to take a picture for a challenge (for the Light Challenge in May) I had a call on my cell phone that my Dad had been put into Intensive Care. He died only a few days later, shortly after I flew to my Mom & Dad's home. This summer my husband and I had a wonderfully fun trip to the Dunes with DPCer Van Truan and his family which took away most of the bad associations with the Sand Dunes and now this picture has made me be able to appreciate their stark and unusual beauty again. Fabulously Fitting Title. Love the shadows and color play. Wow. This is beautful. The golden light is amazing. I've only been there once but did get a memorable shot from my trip. Excellent shot, Sammie! Congrats on your top 5 finish! Terrific shot. Congrats Sammie on your 4th place. Stunning landscape. An image that weaves that dune magic like no other. Congratulations on your top 5 finish. Nice texture and warmth contrast. Congrats on the top 10! Great shot Sammie, congratulations on your 4th place finish! Great work. Congratulations Sammie. I love your Sand Dunes pictures and this is no exception. I couldn't be happier for you. WaaaHooo! I loved this shot Sammie. I wondered if it was Sand Dunes National Park. Sorry to sqeak out the yellow, but it looks like you've tasted ribbon a fair amount already...congrats again on the green. Congratulations Sammie, oh so close to the ribbon but it's my favorite anyway. Great shot and oh so close to a ribbon! Thought you had it for sure. I think if you crop most of the clouds out, then the mirroring of the dunes by the jagged peaks will become more prominent. Through caverns measureless to man ..."
It's a lovely depiction of Xanadu and a striking landscape. The light and the textures are dramatic and memorable; I could recall how this image made me feel even after viewing a couple of hundred others, most of which I mercifully forgot in seconds. 10. After seeing so many nice landscapes, I found myself docking some views because they didn't take enough advantage of the natural beauty. I definitely can't say that about this one. Fantastic play of lights and shadows on those dunes! Very good! the long shadows create a very dramatic feeling, nice capture. The colors here are really nice. The shadows make this image. Bravo, Coleridge wouldn't have pictured a better place for his Xanadu. 8 - Wow. Very nice contrast of landscapes. Criticism; not much, mostly the sky detracts in my opinion in this shot. Whether you were able to adjust it (contrast etc) not sure, but perhaps an even tighter crop (less sky) would have made this a better shot in my opinion, although I realize you'd lose some 'context'. Like the shadow play on the dunes and mountains, but wonder if just a fraction more 'lightness' overall, possibly showing some more of the green in the mountains may have also made it better. Perhaps even more of the fore 'plain' too, especially if cropping out more sky, not sure, who knows. Good shot. Wonderful use of low light. Great picture! Love the colors and contrast! Nicely done - belongs in a magazine somewhere. Beautiful color and contrast. Excellent photo! Very interesting. Shadows help a lot. This is one of my favorites for this challenge!!! It's unique, has wonderful colors, great lighting and shadows, amazing texture...just everything! 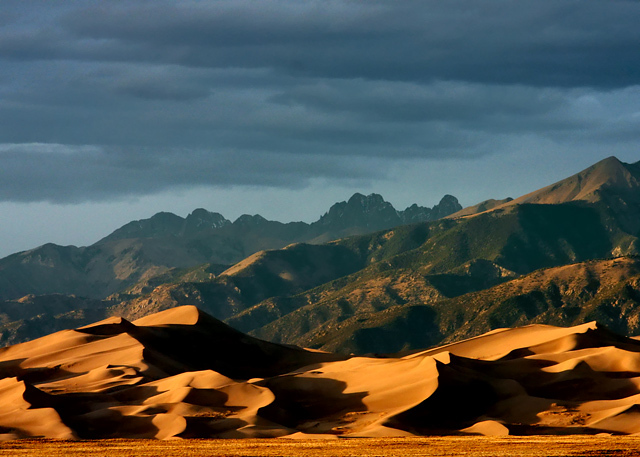 I love the dark sky with the warm colors of the sand dunes...just an amazing landscape. Great job and best of luck!! would have like to see less sky but great shot. Great shot, i love it. Oh Sammie, Its sooooo nice. Even Creston in the back. You did great. Nice diagonal and contrast between the cold colour in the background and the warm in the foreground. You can almost feel the movement in the dunes - a movement that is stemmed by the background and the upwards sloping diagonal. This makes the pic a little static - otherwise a 10. Simply and amazing image. If this doesn't ribbon I'll eat my hat. Very interesting perspective. I love the layers. Great foreboding sky. Love the dunes with the sunlight on them. just wondering, but is xanadu the place described in "dune?" hm.. well incredible picture. it's as if the mountains and dunes are the same except that they differ in material. i wish i lived near these. it looks so fun. great job! Great shot of the Dunes. I love the shadow play you have going. Good job. Proudly hosted by Sargasso Networks. Current Server Time: 04/23/2019 11:56:34 PM EDT.